If you want a Zion and can't get one get the Splinter! I am number 160 on the wait list. Just got the email yesterday. You are right. It's close to Zion performance but will be more accessible because the cost less, it's easier to build and it will work on just about any mod box. is there a box mod you recommend for the splinter? Really anything that can at least handle 40 watts. Do you want a internal battery, single 16850 removable, dual 18650? Is size an issue? 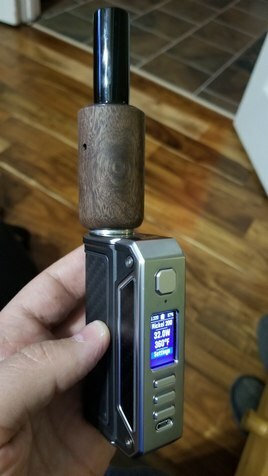 Some folks want really small mods but remember the Splinter is larger than a typical juice atty so putting it on top of a small mod make look akward. There are also no side by side mods currently on the market that will fit the Splinter so avoid those. Will you use this same box for other attys including concentrate ones like the SAI or Divine Tribe gear? If so I would spend a bit more and get something that has good temp control. If you only want it to use with the Splinter than TC is not required. Hi Philly - I have an Eleaf mod that I'm VERY happy with. Has two 18650 batteries, rather full function, has temp control and settings for various coil materials, I like the ergonomics of how it turns on (squeeze it), and you can get them for about $30 if you look around (not including the two 18650's). I've owned it for at least 1 1/2 years and its been solid. I have been told (but can't confirm) that Joytech owns Eleaf so you might want to look there also. When I was first shopping for a box, I got all excited about these expensive box mods with like DNA 2000 chip sets (I think I have the nomenclature correct), etc. Glad I didn't buy one as I found that whatever magic sauce these more expensive mods have is just not required for my purposes (mostly driving concentrate carts and atomizers like DT 2.5). Actually Baron the DNA mods are wonderful for the concentrate atty's (as mentioned above). I have a couple of them and they take TC to the next level. A less expensive alternative is to get a mod that supports Arctic Fox. This is near DNA chip quality but the download is free and compatible with several popular mods including ones from Eleaf and Wismec. But again for the purposes of the Splinter any old Mod that pushes at least 40w will do! I am just using it for the splinter and occasionally for concentrate cartridges. I would really like to utilize the 18650 batteries since I already have them. Does the DNA have a noticeable difference than a normal mod when using the Splinter? nope not with the Splinter but yes with the concentrate mods. You want a smaller single 18650 or a dual/tripple/quadruple 18650? I'm sure they are....but they are much more expensive also but I don't see any practical advantage for my use cases. Ok, TC may be better but, and not to be too argumentative, so what...we are in general just driving a resistive coil to boil off a volatile substance. Still may get one some day....but I'm having trouble seeing the benefit. a single for travel and a dual for home use. The 3 and 4 battery mods look like monsters. No point in discussing. You have your mind made up and that's ok. They are not for everyone. A good relable economical single 18650 would be the Istick Pico. You can also flash this to Arctic Fox should you choose. Don't forget the heat sink with this. You will need it for clearance since the battery door would otherwise prevent attachment of the atty. I think Baron's suggestion on a dual battery is a good budget option or you could go with the Wismec Predator if you want something you can flash to Arctic Fox. But there are plenty of others in both categories that will work just fine here. Especially if your main purpose is the Splinter which only requires wattage mode, not TC. do you have a personal favorite DNA box? There are several versions of this including ones that go to higher wattage or have different displays/button configurations but this one here is about as cheap as you will find and serves the purpose for the Splinter and any wax atty on the market right now. There are different configurations for trim and door material but the yellow one and wood trim is one I have on order for use with my Splinter and Sequoia Donut setup. If you don't like the yellow door you can pick another one with a different door and black/CF trim or just buy a different door off eBay. This is a high quality built mod with a nice refined look and great performance. Here is another with the mouthpiece RBT provides. Well, I'm not sure we even had a discussion, tbh. I merely posited that I am not aware of any additional benefits from these more expensive mods over cheaper ones. But you also haven't specified what's better about them? Seriously, what makes them worth $80 - $160 dollars more? If your focus is on budget as you have eluded to with your suggestions then I just feel it would be hard for anyone to provide a case you would accept. These DNA mods offer much more precise and consistent temp control along with an increased ability to tweak the settings to your preference. Most people would not care nor find the value in that. Especially for the purposes we use them for. Beyond that the build quality and reliability is typically better. In the case of these Lost Vape varieties I just like the asthetics better than many of the mods out there and I for one and willing to pay more for that. Call me a snob but it matters to me. I also recognize it doesn't matter to others. hey there....just as a follow-up to this. I have been playing around with my Therion DNA mod/ Splinter and hopefully this next statement will provide some perspective on the impact of a good mod. I was a beta tester for the Splinter and I used it almost exclusively for months with a cheaper Tesla TC mod box. I always found the performance more than acceptable for what it is but not quite on par with the vapor quality the Zion kicks out (even with a very similar heater setup). That made sense to me because I consider the Zion one of the best in my very large collection when it comes to vapor quality. Now I have this new DNA mod and I have been playing with the settings including going from watts mode to TC mode. In the past I didn't mess with TC too much because no didn't really notice a whole lot of difference. But now I have a mod that does TC well and OMG I am astounded on the quality of vapor the Splinter is kicking out. Smooth, tasty with the perfect density, it's just crazy! I'm a low temp guy for the most part. I have it set in Nickel TC mode at 36 watts and temp set to 365 and oh my. Dare I say this is BETTER than Zion? Bottom line is I think this chip controls even better than the Zion chip. I push the power button and it pegs at 365 in half second and stays there which is a far cry from some of the mods I have used. I also think the latest Splinter has the perfect amount of draw restriction as it's not as wide open as the Zion/Milaana. This will help more people on technique and promotes the perfect vapor density. I purchased the yellow one as seen on the right because it has wood accent. The other mods are also 75 W DNA's from Lost Vape but just different versions. All around the same price. The glass mouthpiece stems will require some different effort to use with the RBT gear since his stuff on your accepts a fitting 22mm in length. Here is the stubby green one. That said it comes standard 26mm length so I had Ryan cut mine down. I did enquire with 7th floor if they would cut them down and they said they would. Not sure on charge tho. The Rasta long mouthpiece is actually an SSV wand. See here. That said you will see this has a female fitting. Originally I was using this as a wand for my Marley SSV but I broke the female joint off it. So I saved the Rasta part, took a Zion clear mouthpiece over to a local glass blower and he hooked it up. This is something 7th floor would also probably do on a custom order if you were so inclined. this has me giddy for a Splinter! 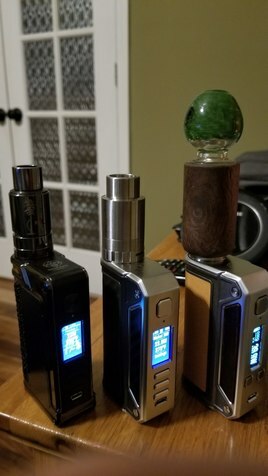 I haven't reached for a single vape in weeks (besides my Omnivap on the go). Can you measure the total height of mod, Splinter and mouthpiece? It looks pretty towering all together like that but can't tell if its more related to camera angle. Thanks! most of these are home only set ups. I typically use the stock shorty RBT mouthpiece stems when out of the house. I will measure all when I get home. And yeah I understand. 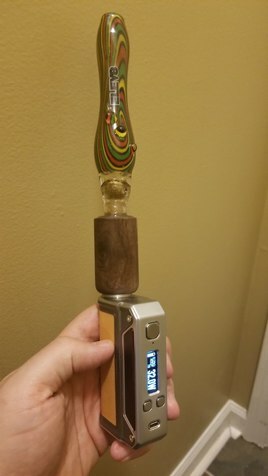 I also have been testing the Milaana 2 and wearing that out prior to this. 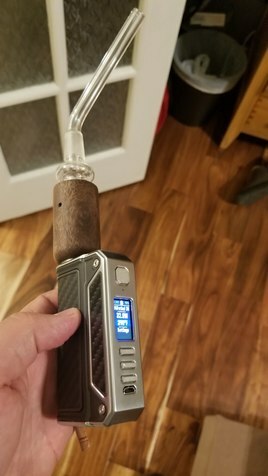 It was my out of the house vape but I have been enjoying the Splinter so much that I have shelved it for a while! thanks so very much. I’m on a phone and out of town so please pardon brevity. But a question, you set temp AND wattage?? My understanding of TCR is that set point temp and resistance in ohms then determine voltage (and hence watts). I don’t understand setting wattage for TC. Because the Splinter appears to have a much greater girth than the atomizers that most single and double battery mods are designed for, do you think a 3 battery mod might be more aesthetically appealing, as well as more stable when sitting...? yeah I think getting a larger mod with multiple battery capacity serves a dual purpose. One you need the extra battery power or you are going to be swapping batteries a lot. And yes the size matters. I saw some of the beta testers using it on a small mod and you are right, it looks awkward and unstable. As far as a three battery vs the two I'm using. Well you be the judge. I think the three battery would look great but I am happy how it sits on my two battery mod as well.